The new space located in Billinghurst and Av. Las Heras, Recoleta, will offer an innovative proposal that is already revolutionizing the model of banking attention in the world. It is a new branch of Banco Galicia where you can experience the Starbucks Experience. The new headquarters has 282 m2, and is part of the Bank’s expansion plan, through which it seeks to provide a differential experience according to the needs of the market. Those who come will find a pleasant and relaxed atmosphere, they can enjoy a coffee, have a private co-working space with a prior booking system, and request information and specialized advice on the services and financial products offered by Banco Galicia on time extended. They will also have WiFi to use their devices in the livings, and self-management terminals for those who prefer to carry out their operations independently. Accompanying the proposal of the new model of attention, arrive the “Starbucks Breakfasts” to Galicia. Bank customers can enjoy, for a limited time, a 15% savings with Galicia Debit Card in all Starbucks stores in Argentina, from 6 am to 12 pm. “At Banco Galicia we promote the transformation of the sector in all spheres. Regarding the model of care, we accompany the evolution with a multiformat proposal according to the changes of social habits and ways of working. Thus, we incorporate the concept of “Coffee Banking”, an innovative trend through which we seek to provide a relaxed environment where current and potential customers can be advised and assisted by Bank staff through technology and digital media, and can also contract our products from the comfort of the place, “said Germán Ghisoni, Retail Banking Manager of Banco Galicia. 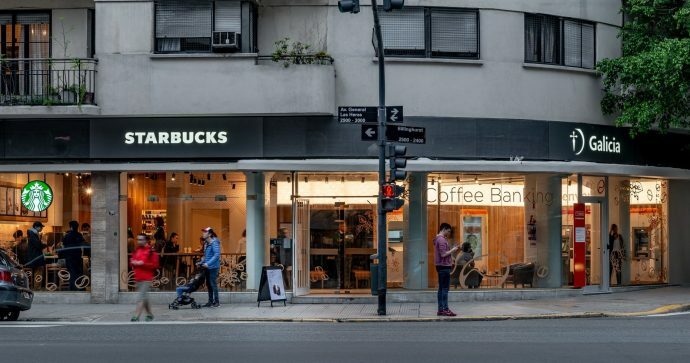 In this line, Máximo Pellegrino, Marketing Manager of Starbucks Argentina added “We are very happy to offer the possibility of living the Starbucks Experience through innovative initiatives such as the new branch” Coffee Banking “of Banco Galicia.”. With this new opening, Banco Galicia has 318 branches throughout the country, providing a personalized service to all segments and customers.